The original forebears of the Chesapeake Bay Retriever are believed to have been Newfoundlands, rescued from a foundering ship in 1807 where they were taken onshore and crossed with native dogs of Maryland, including spaniels, hounds and retrievers. Thus the Chesapeake Bay Retriever evolved, deriving its name for its early usage as a water retriever in the cold waters of the Chesapeake Bay. Earning a reputation as a willing and efficient retriever, the Chesapeake became a popular breed choice for hunters, braving the icy waters to retrieve up to 200 waterfowl and small game birds every day. Officially recognised by the American Kennel Club in 1878. A breed of proportioned build, possessing a powerful stature with a broad head, high-set ears, clear, wide-set eyes of an amber or yellowish hue and straight, muscular legs suited to water crawling. The Chesapeake's coat is characteristic to the breed, typically short and oily, repelling water and helping the dog to dry off quickly. The natural oils of the coat are often blamed for the Chesapeake's distinctive canine smell. Relatively rare, owners of the Chesapeake have noted that the breed is slow to mature, often displaying a boisterous and challenging temperament into adulthood. For this reason, firm leadership, early socialisation and consistent obedience training is encouraged from a young age. Uncommonly seen outside its native land, the Chesapeake Bay Retriever is still utilised as a water retriever, retaining its early hunting instincts. Highly intelligent and trainable, the breed is recently observed in the domestic setting, proving itself as a versatile and adaptable companion dog. With a gentle and relaxed temperament, the Chesapeake is the ideal breed choice for active families or the dedicated sole owner, inherently protective of children and compatible with other house pets when introduced gradually. 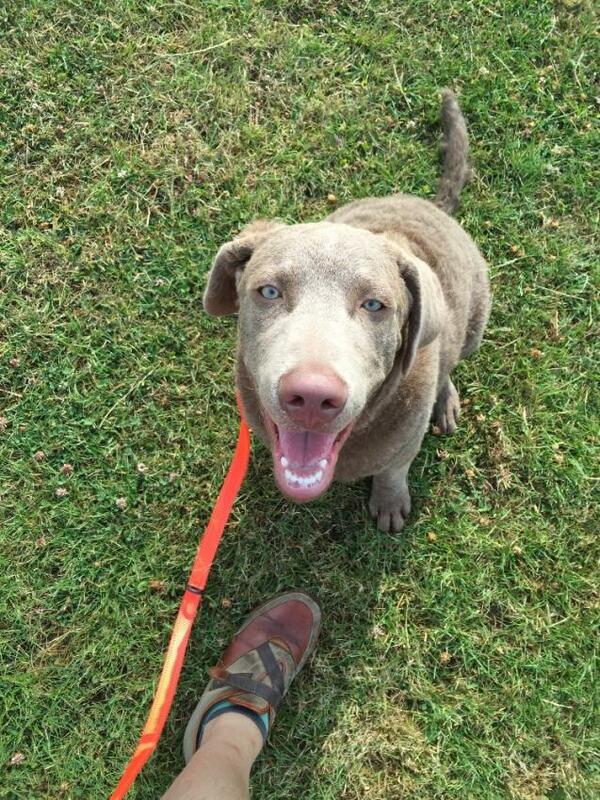 The modern Chesapeake is also observed in field trials, tracking, obedience, conformation and agility. Weighing an average of 25-36 kg depending on its gender, with a life expectancy of 10-12 years. Typically healthy and resilient, the Chesapeake is relatively low maintenance when it comes to supporting optimum health. As with most breeds, however, cases of hip dysplasia, optical disorders and cancers have been identified in the breed, as well as documented cases of von Willebrand's Disease, a rare bleeding disorder. This is my beautiful boy Max, he is nearly 13 years old now but he has a spinal problem that will only get worse and my heart will be broken when I have to let him go. He is still so bright and alert and it is such a shame that he now struggles to walk about as he used to do. We used to walk miles and he was such a good strong swimmer. He has been my soul mate and loyal friend through many a difficult time. A lovely boy not just a dog. I rehomed him from the breed rescue when he was 17 months old, I was his 3rd owner, what a dire start for him in life. Their lose my gain. He is the 2nd Chessy I have owned and I must say they are a lovely breed if well trained and exercised. They do shed their hair quite a bit and will need regular grooming. 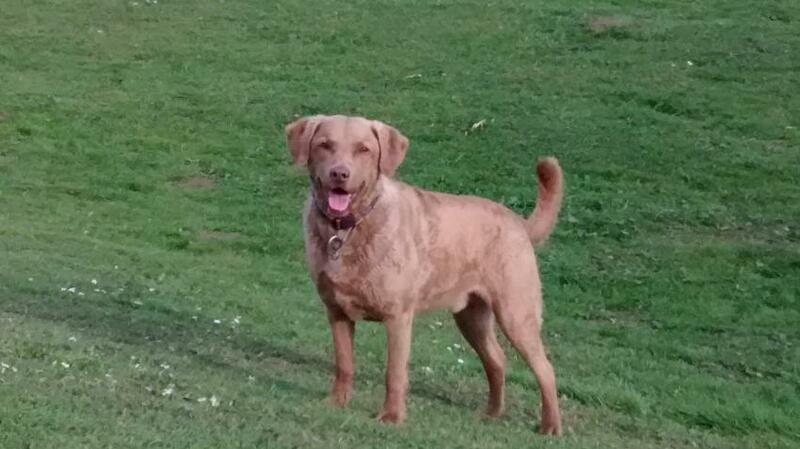 Do you own a Chesapeake Bay Retriever? Let others know what they're like!